I know that this post has been a long time in coming. Part of me wants to apologize for that, but the other part of me won't with the hope you understand. Some stories are harder to tell than others. I've said before that I gravitate toward improvisational quilting because I love all the reacting and expressing that is part of the process. Often I end up with a piece that says so much more than I ever intended. 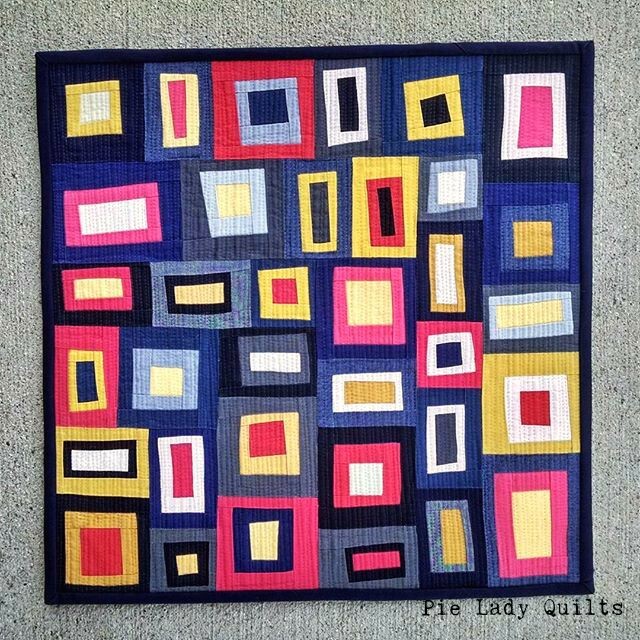 Such is the case with this first quilt. I pulled out a whole bunch of red fabrics to play with this summer just because I noticed that I had two duplicate spools of red thread. I started piecing a few rows of improv triangles and had the thought that the quilt needed a little more sparkle. 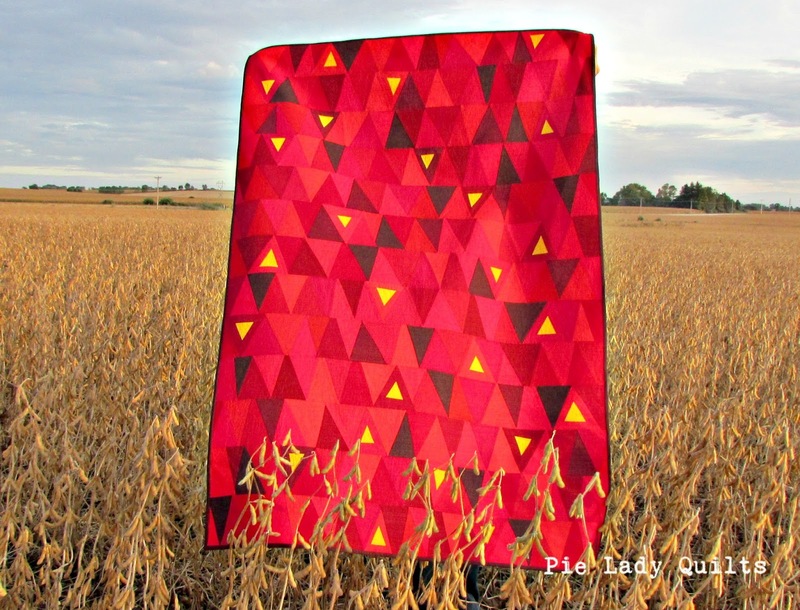 I brainstormed a few ideas on how to add an accent color, and finally decided on surrounding a tiny triangle of gold with more red and insetting them into the rows. I had to laugh because I was also simultaneously brainstorming a way to share the news with my friends and family that we were expecting again. I figured that the pregnant triangles I was piecing into the quilt were good enough for both jobs so I posted a picture of this quilt on social media as a way to share our news. "The Announcement" finishes at 38" x 56." (The pregnancy will "finish" somewhere in mid to late February.) 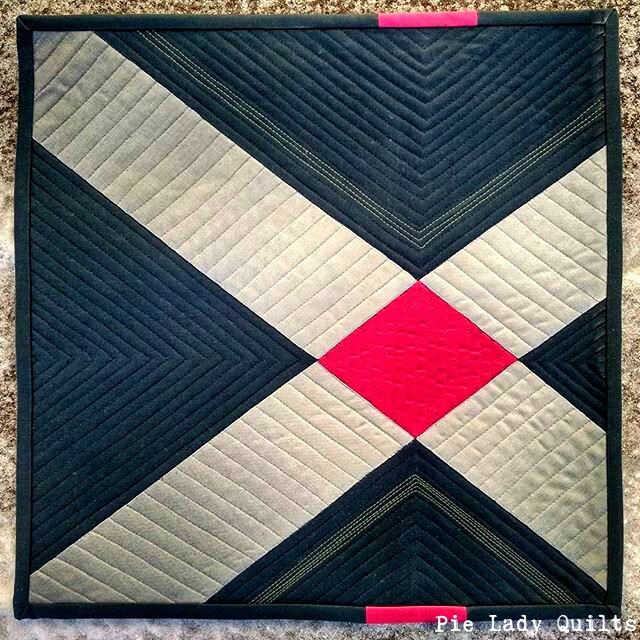 I used Quilter's Dream Request batting and matchstick quilted it with Aurifil invisible thread so I wouldn't alter any of the color work. This pregnancy was long awaited and very slow in coming. When I was a little girl, my siblings were teenagers. Sometimes my parents needed to have a talk that was necessary for older ears, but not so appropriate for mine. Whenever that happened, my mother would stand in front of the kitchen window, gasp in wonder and say, "Look, Jill! Your cat is chasing a butterfly!" I would excitedly run out the door in breathless anticipation to see such a sight and my mom and dad could have a private conversation with the bigger kids. I've recalled that experience often over the last couple of years and I've decided that there is no better metaphor for infertility than "chasing the butterfly." The process is often long, unpredictable and powered by mere glimpses of what could be. It also feels like an exercise in futility on a lot of days. It can be hard when something so beautiful is so elusive. 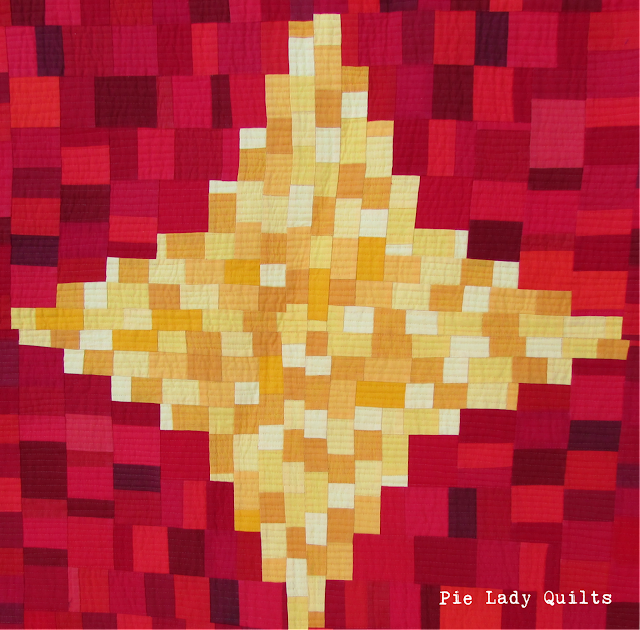 I created two quilts exploring this theme. The first, "Chasing the Butterfly I," I made at my mom's house this summer. 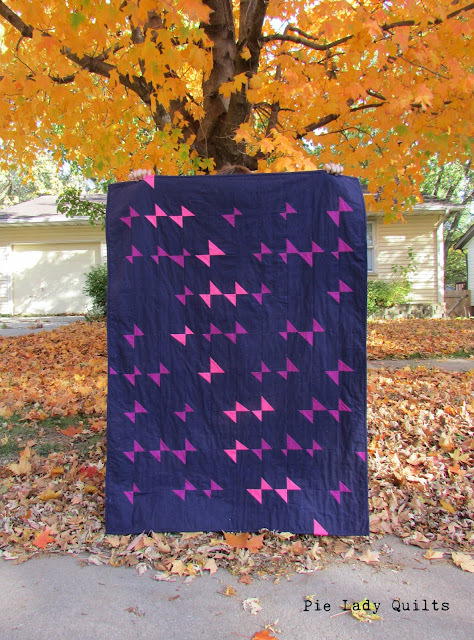 I used the idea of an Exquisite block from Gwen Marston's book Liberated Quiltmaking II. 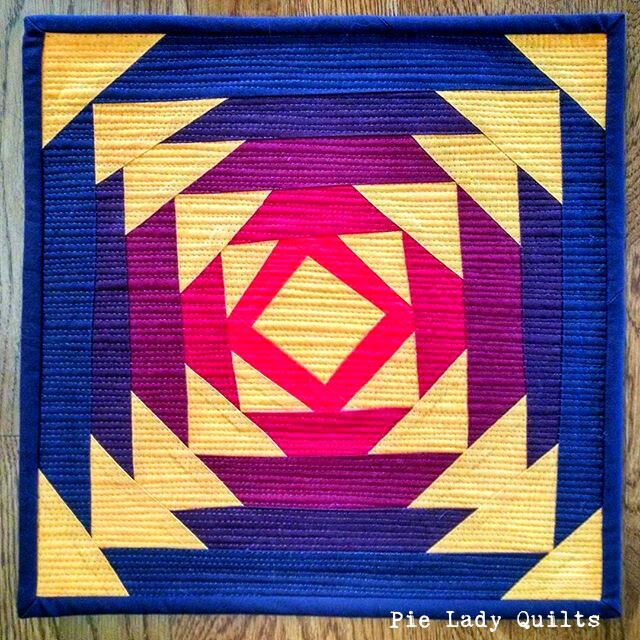 I blanked out some of the blocks and added an additional color to the scheme to create a lighted path to pull the eye through the quilt. 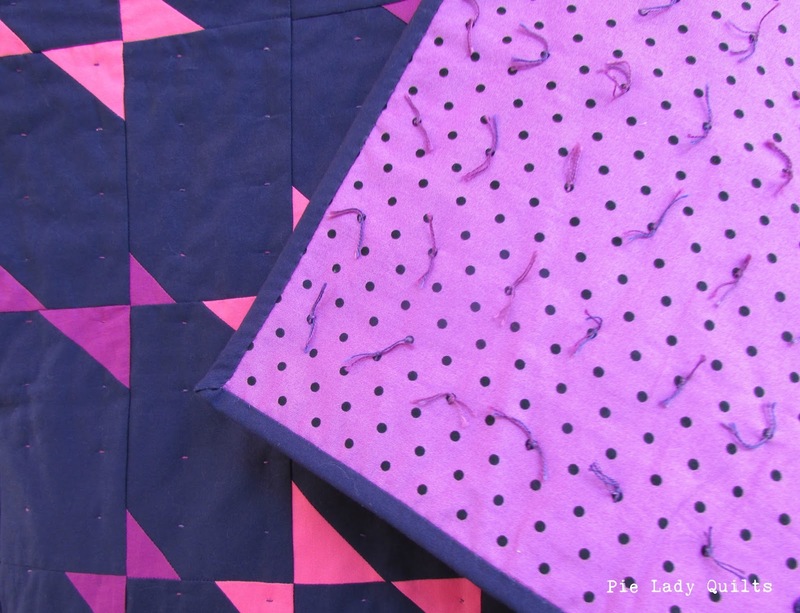 I hand tied the quilt on the long drive home, using the polka dot backing as my marking structure and tying the knots from the back. I used a variegated Valdani thread, so there are tiny winks of color on the front of the quilt that I am especially happy with. The quilt finishes at 39" x 54." I tried another approach for "Chasing the Butterfly II." I made a full scale drawing of the butterfly, then made myself templates to construct the chunks. I ended up using needle-turn applique to attach everything to a muslin foundation. If I had it to do over again, I would piece it. 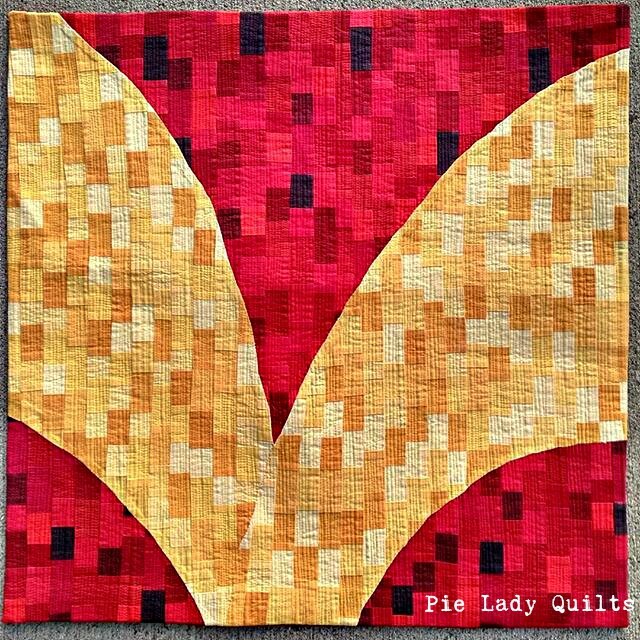 The curves were gentle enough that this would have been totally possible, and I could have avoided some of the shadowing that I got from the darker red fabrics peeking through the golds. Nonetheless, I still like it. The quilt finishes at 24" x 24." I used invisible thread to matchstick quilt this and it is finished with a faced edge. I have been a patient at the fertility clinic in our local hospital for the past two years, and I am thankful for all the support and love that has been shown to me during my time there. We were initially very optimistic because after my first appointment, with all of the data gained from the tests and with the treatments prescribed, I was able to become pregnant very quickly. But then I wasn't. And I wasn't. And I wasn't again. I have failed at many things in my life, but one thing I have never failed at was getting back up again after a blow. I almost couldn't do it this time. Sitting in the doctor's office with a brand new diagnosis of recurrent miscarriage was one of the lowest points of my life. The last gasp of my faith after the third loss had been to pray for my doctor to know how to help us. At the end of our discussion with a list of expensive and invasive options for my husband and I to consider, I wondered if it would be possible. When the appointment was over, I waited for her to stand up. She didn't. She stared hard at the carpet. She checked my file on the computer and stared at the carpet some more. Finally she said, "I shouldn't need to check this again, but I feel like I need to. Can we add on one more test to your blood work today?" It was the easiest test suggested from my list of options so of course I agreed. Thankfully it revealed a problem, easily fixable with time and medication, and after 3 1/2 years of hoping and trying, we finally had a baby on the way. "Trying" is my quilt story of the journey through recurrent miscarriage to a miracle baby girl. I used the idea of a wide and narrow log cabin setting with pieced strips to make stylized, unfinished positives. I really love how the finished block resembles a flower. Looking at this quilt isn't a sad experience for me. In it I see that my faith has been tested, but in the end it flowered and made a safe place for my little butterfly to finally land. 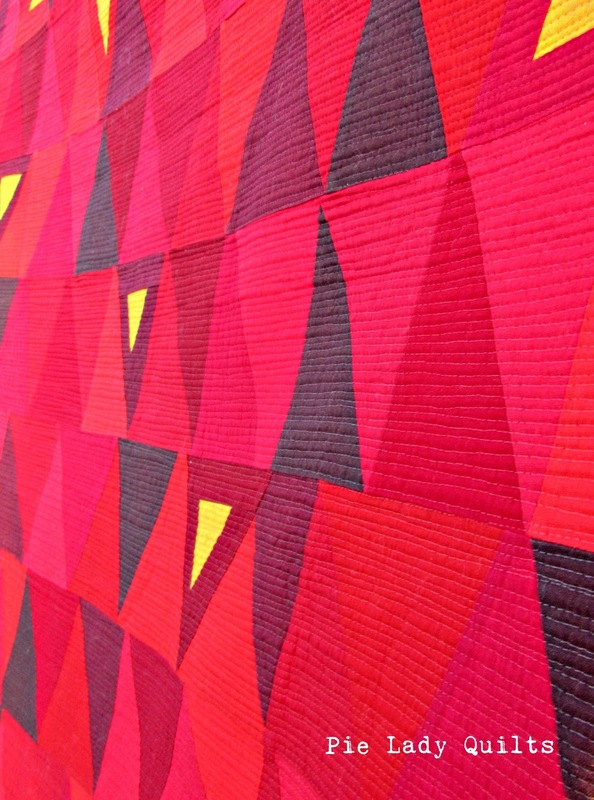 This quilt finishes at 48" x 48." 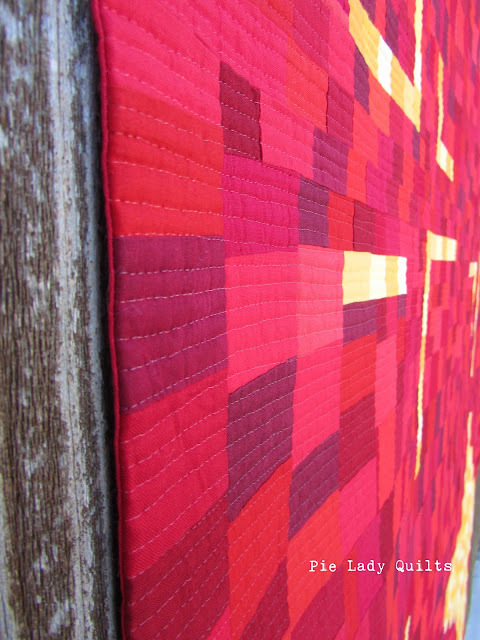 I used Quilter's Dream Request batting and did straight line quilting with Aurifil invisible thread. It is finished with a faced edge. Just the other day, my older son rubbed my belly and told me that he just knew that this little baby would be special. "How do you know that?" I asked him. "Because we had to wait so long for her," he said. I'm so excited for her to be born." My next post will not be six months in coming, I promise. Right now I'm on baby watch and nesting with the Pantone Color of the Year. In the meantime, I'll share three minis I also completed in the last few months. "Curated Cabins," 16" x 16." 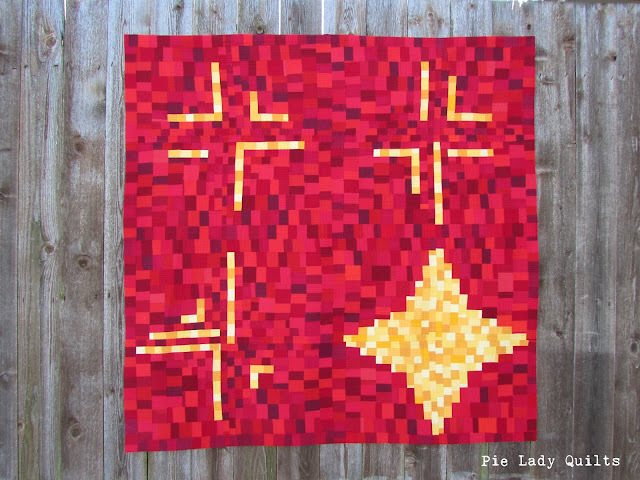 This one was made for the log cabin prompt from Curated Quilts. "The Doctor Pepper Sunshiney Pineapple," 12" x 12." I made this one for inclusion in a group birthday gift for a friend. The brief was to include everything citrus. When I asked if a bottle of Dr. Pepper (her favorite) was going to be included, I was told we couldn't put it in because it didn't match the colors. That was a challenge I couldn't pass up. Mwah-ha-ha! Look what matches now!! My contribution to the gift was this mini and a bottle of Dr. Pepper. "Reining in My Exuberance," 15" x 15." 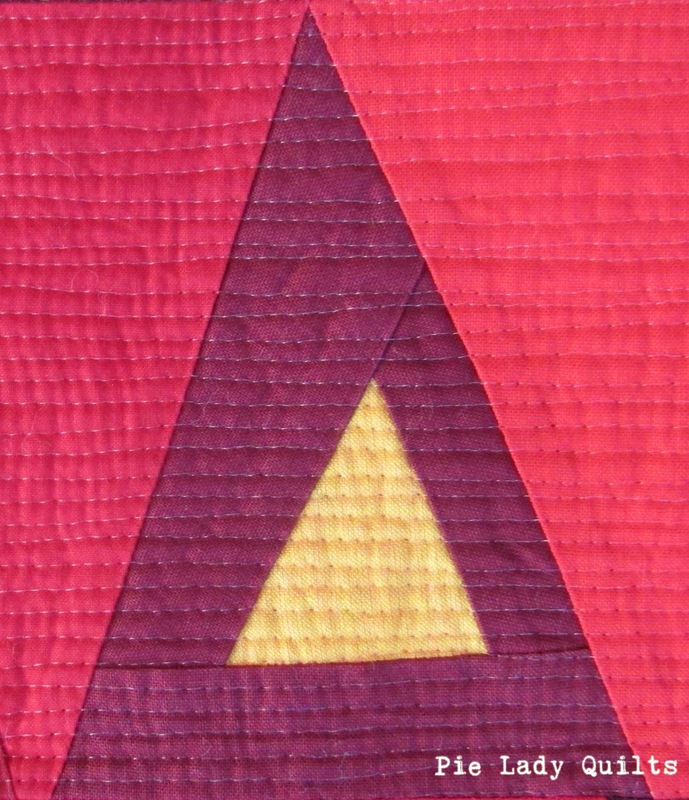 This was a mini that I made for the minimalist prompt from Curated Quilts.